Izalith was once a city constructed in the undergrounds of Lordran, in what seems to be a natural cave system. It is important to say that it also seems to be directly below an archtree. The dravidian theme of the city is unique in Lordran, as were the flame sorceries that the Witches of Izalith dominated and probably imparted there. Izalith is only accesible through Demon Ruins, which were probably the outskirts of the city. At its core, a dome has been built in the shape of a Kiln where the Witch of Izalith attempted to desperatedly recreate the then fading First Flame. The ritual was a failure and it instead distorted the Witch into a being of chaos and fire, the Bed of Chaos. The chaos flames brought ruin to the city, killing and mutating its population and wildlife. Chaos demons were born from this new bed of life, as well as the art of Pyromancy. There is lava all around the city, in the outskirts and in the ruins. While the lava seems to have been making a big role regarding the chaos flames and the mutations, it is unknown if the molten rock is itself a product of the failed attempt of the Witch. Izalith is deep underground, and it wouldn't be strange for lava pools to appear at these depths. The Flame sorcery imparted by the Witches can also be related to the lava, even before the creation of the art of Pyromancy. Solaire of Astora will appear at the first bonfire when after the Centipede Demon is defeated. Siegmeyer of Catarina also visits here; he can be found in front of a pit of Chaos Eaters in the old sewers of the city. If the player wakes him, he will valiantly offer to attack the demons below to grant a safe passage, and continue his quest. Otsuka: Moving even further down to the Demon Ruins and Lost Izalith, they have a different feel to the previous areas, don't they? Miyazaki: I mentioned previously that Dark Souls was divided into three main themes. The demons are all based around the idea of Chaos, but we had to think long and hard about how to convey that image in a map. We decided on an oriental theme. I'm worried people may take this the wrong way but oriental things possess a kind of chaos, or to put it differently, they lack a kind of peace or order and that's what I wanted to capture. The best example of this is found at Angkor Wat in Cambodia and in the areas surrounding it, where East and West Asia meet. Ember required for weapon ascension. 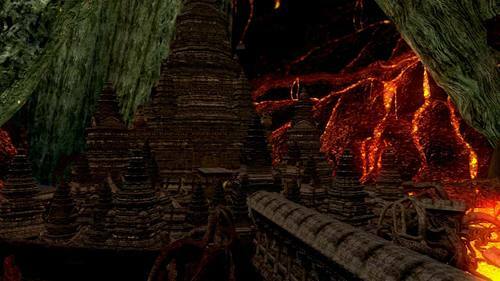 Chaos Flame Ember is an art of the lost city of Izalith. Handled only by blacksmiths knowledgeable in ancient methods. Chaos weapons are demon weapons augmented by humanity which inflict fire damage. A loathsome parasite that inhabits Lost Izalith. It is completely immobile, yet still lives. When worn on the head, it emanates blinding light, which is why it is known as a Sunlight Maggot. Art of the Flame of Chaos, which engulfed the Witch of Izalith and her daughters. Catalyst of the Witch of Izalith of long ago, when her daughters were still flame witches, before they were engulfed by the Chaos Flame.